Blog > Cannabis Education > Medical Conditions > Marijuana and Diabetes: Can the Two Work Together? Marijuana and Diabetes: Can the Two Work Together? In this post we’ll explore the intricacies of how marijuana and diabetes interact with one another. Type 1 Diabetes, also known as “Juvenile Diabetes,” is actually a genetic condition in which the pancreas is incapable of creating sufficient amounts of insulin to meet the body’s needs. As a result, patients with type 1 diabetes often require insulin injections multiple times, every single day of their life. With type 2 diabetes, more widely known as “Adult Onset,” the body does produce insulin, it just doesn’t produce it properly. And that “improper” insulin production signals the pancreas to produce even more – more than the body needs, or can process. Feast or famine. With one out of every ten Americans affected, researchers are working hard to help patients better manage the potentially life-threatening disease, which from this perspective means taking a hard look at how marijuana and diabetes engage each other. By alleviating the symptoms of restless leg syndrome, an associated condition for many with diabetes, it facilitates better sleep, which in turn helps increase overall body function. Additionally, the AAMC reported that topical ointments or rubs made with cannabis CBD oil were helpful in reducing symptoms such as neuropathic pain and tingling sensations in the hands and feet. But the research didn’t stop there. Since 2005, there have been countless studies done on the benefits of cannabis for people with diabetes, including one done in 2013, and published in the American Journal of Medicine. That study quickly became a cornerstone for discussing the potential of cannabis to help battle the disease. And while doubt surrounding the drug’s effectiveness for delaying the onset of type 2 diabetes continued to linger, the AJM report left little doubt that marijuana was helpful (and healthful) for those already diagnosed with diabetes – type 1 or type 2; further noting its benefits for patients who experienced associated complications. 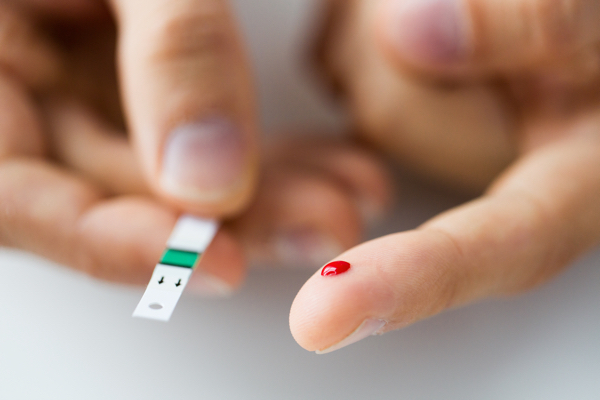 Because the results of the study apply to patients with both type 1 and type 2 diabetes, it has the potential to change the face of how people live with the disease. Type 1 patients, for example, may benefit from the lower fasting level with a reduced need for insulin injections. So while it is unlikely that cannabis would ever completely eliminate the need for insulin injections 100%, it could cut the number of injections a patient needs per day in half. Because type 2 diabetes is more ‘resistant’ to insulin, cannabis has the potential to slow down the advancement of the disease, by helping the body develop its ability to manage sugar levels naturally. Marijuana and diabetes are not mutually exclusive. Both type 1 and type 2 diabetes carry associated conditions and complications that can make life even more challenging. In addition to neuropathy, people with diabetes are often diagnosed with glaucoma, high blood pressure, and peripheral vascular disease. Proximal neuropathy: perhaps the most frightening, is typically ‘one-sided’ and sudden-onset, striking the hips, thighs and buttock. Multiple studies have concluded that cannabis not only alleviates pain, but arrests the advancement of nerve damage known as neuropathy. People with diabetes have an increased risk of developing glaucoma (pressure build-up within the eye, which can result in pain and blindness) by 40% compared to those without the disease. Medical marijuana’s benefits in reducing inflammation for glaucoma sufferers has been well-documented, and is frequently prescribed by physicians for their patients. In connection with diabetes, peripheral vascular disease causes a reduction in circulation in the legs. Plaque hardens in the arteries, shrinking the amount of space the blood had to flow through. Cannabis helps the arteries to essentially ‘relax’ allowing increased arterial blood flow. Studies show that cannabis also has positive effects on angina (severe chest pain caused by insufficient blood flow to the heart). With smoke inhalation being considered the primary reason for reduced doctor recommendations, the evolution of cannabis edible and teas is expected to have a significant impact on reversing the trend. When you consider that physicians are prescribing synthetic cannabinoids as Cesamet, Marinol and Sativex, you have to wonder how much longer will it be before they get back to the source of the medicine; the heart of the healing. Before I started taking weed for my diabetes I was miserable, couldn’t do nothing, the pain in my feet was so bad. But now I can down to the store on my own and even go for a walk now and then, if the weather’s nice. Thank God I found a doctor who cared more about me than what people thought. –George H.
It works for me. I was having a brutal time with restless legs. I couldn’t sleep. I was so tired the next day. I couldn’t work. I was on disability. I felt helpless. [Medical marijuana] is the reason I am able to go to work every day. I can help others who can’t and that makes me feel good. –Ranvir R.
Weed? For Diabetes? Are we still even asking that question? –Kerry F.
Just click the button below to start shopping dispensaries in your area! While CBD’s healing effects aren’t scientifically conclusive, we think it’s definitely worth a try. Hope it works for you!